Gangtok Gangtok is the Capital City of Sikkim State (sikkim is the 23rd. State of India) Which is also Known as Peaceful & Most Beautiful State in India. Discover the Magnificent Sightseeing of Gangtok City. Gangtok is the Prime Tourist Attraction of Sikkim State and Located in the Eastern Part of Sikkim. Beside the Gangtok Local Sightseeing Tour Including Tsomgo Lake Baba Mandir Nathula Pass Tour Most of the Tour Packages to North Sikkim Start from and End to Gangtok City. North Sikkim North Sikkim District is the Popular and Most Beautiful Travel Destination in Sikkim. North Sikkim also Known as Little Offbeaten Tourist Places in the Northern Part of Sikkim. It Takes Around 7 to 8 Hours Drive By Road from Gangtok, the Capital City of Sikkim State. 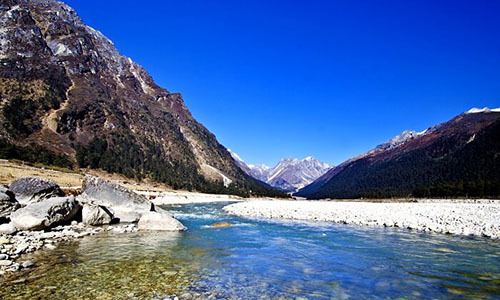 There are Many Places to Visit in North Sikkim Likely Most Visited Places are Lachung Yumthang Valley, Lachen Valley, Gurudongmar Lake and Many More. Best Time to Visit September to December and March to June. Try to Avoid to Travel July and August Due to Rain Time. Day 1: Pick-up At Bagdogra Airport / Njp Railway Station Â€“ Gangtok (5,500 Ft), (128 Kms / 5hrs).meet & Greet On Arrival At Bagdogra Airport /njp Railway Station & Transfer to Gangtok.overnight Stay At Gangtok. Day 2: Morning Drive to Lachen (9,400 Ft, 124 Km). On the Way Visit Twin Waterfalls, Singhik View Point. Lunch At a Local Restaurant On the Way. Check in At Hotel in the Late Afternoon. Overnight Stay At Lachen. Day 3: Morning Drive to Thangu (13,500 Ft, 31kms from Lachen). Visit Chopta Valley (13,200 Ft) It is Rich in Alpine Vegetation. Drive Towards Gurudongmar Lake (17,800ft) Only Indian National is Allowed. Gurudongmar Lake is One of the Highest Situated Lakes in North Sikkim. Remember the Altitude Here May Cause Breathing Problem. Back to Hotel & Leave for Lachung (alt 8,610 Ft, 60 Km). Overnight Stay At Lachung. Day 4: Early morning drive to Yumthang Valley (Alt 11,800 ft), 24kms an Alpine flower valley in North Sikkim. Enjoy the scenic landscape and Hot spring and drive back to Lachung for Lunch.Overnight stay at Gangtok. Day 5: After Heavy Breakfast Start a Tour to Tsomgo Lake (12,400 Ft, 34km). Lake is 1 Km Long, Oval in Shape and 50 Ft Deep. Here You Can Find Snowfall & Yak Riding. Visit to Legendary Baba Mandir Overnight Stay At Gangtok. Day 6: Drop to Bagdogra Airport / Njp Railway Station According to the Schedule. Tour Ends.